In broadcasting, a flagship (also known as a flagship station) is the broadcast station which originates a television network, or a particular radio or television program that plays a key role in the branding of and consumer loyalty to a network or station.This includes both direct network feeds and broadcast syndication, but generally not backhauls. Not all networks or shows have a flagship station, as some originate from a dedicated radio or television studio. In the U.S., ABC Radio programming is produced by ABC News and distributed by Cumulus Media, which owns and operates WABC in New York City and KABC in Los Angeles (among other stations). CBS Radio produces programming for distribution by Westwood One, but local stations WCBS and WINS in New York City and KNX and KFWB in Los Angeles are operated separately from the network radio news operation. Clear Channel Communications follows a similar model: flagship stations WOR/New York City (which it acquired in 2012) and KFI/Los Angeles are both operated mostly separately from its syndication wing, Premiere Networks (Premiere does produce some limited programming, including The Jesus Christ Show, The Tech Guy and Handel on the Law, through KFI). Fox Sports Radio's flagship station is KLAC in Los Angeles, with which it merged operations in 2009. Yahoo! Sports Radio is flagshipped at KGOW in Houston; its predecessor, Sporting News Radio, was previously flagshipped at WIDB (now WNTD) in Chicago. CBS Sports Radio is nominally flagshipped at WFAN (although that station does not produce programming for the network). ESPN Radio's technical flagship is affiliate WUCS which serves its base of operations in Bristol, Connecticut, though WEPN-FM in New York (leased from Emmis Communications) and Los Angeles station KSPN serve as true flagship stations. NBC Sports Radio has no definitive flagship stations. Nash FM, a country music network, is nominally flagshipped at WKDF in Nashville, Tennessee. WOR (710 AM) in New York City was the flagship station of the syndicated programs of Jay Severin, Bob Grant, The Dolans and Joey Reynolds produced in-house with its own network. KABC (790 AM) in Los Angeles was the home base of Larry Elder until the show ended its run in 2009. WWVA (1170 AM) flagshipped the Wheeling Jamboree from 1933 until the late 2000s. A flagship television station is the principal privately owned television station of a television network in the United States, Canada, Mexico and Australia. ABC, CBS and NBC are headquartered in New York City, which is the largest television market in the U.S., so their respective radio and television stations in that market are considered the overall network flagship stations. As programming schedules increased and modern technology improved transmission to affiliates, the networks set up operations centers in New York City (for the East Coast feed) and Los Angeles (for the West Coast feed). Los Angeles is the second largest television market in the U.S., and traditional home to the motion picture industry and its pool of popular talent, one of the reasons the radio networks set up operations there in the 1930s and 1940s. 1East Coast flagships are located in the New York City designated market area (DMA), while the West Coast flagships are located in the Los Angeles area. The CW's Philadelphia and San Francisco stations are listed as the largest CW stations owned by CBS Corporation (and thus are directly owned), while Tribune Broadcasting owns KTLA and WPIX. Miami stations are also listed for Univision, Telemundo and UniMás (formerly TeleFutura) due to their operations being major production bases for those networks. The Miami area stations for Ion Television are also listed due to their parent company being based out of West Palm Beach; however none of the Ion stations listed originate programming for the national Ion network. In sports broadcasting, the flagship television station is the sports team's primary station in the team's home market that produces game telecasts and feeds them to affiliates. For example, WJBK in Detroit is the flagship station of the Detroit Lions Television Network, which feeds Detroit Lions pre-season football games to six stations in Michigan. However, the "sports flagship television station" is rapidly becoming a thing of the past, with the growing popularity of cable- and satellite-exclusive regional sports networks such as Fox Sports Net and Comcast SportsNet, which hold exclusive broadcast rights to several teams in their market (with the exception being the NFL, where the flagship television station is also the broadcast television station that airs that team's Thursday and Monday games in that market in compliance with the league's anti-siphoning policy). Notes: English-language eastern flagships are located in Toronto, French-language eastern flagships are located in Montreal, and West Coast flagships are located in Vancouver, except in the case of CTV Two, with its eastern flagship in Barrie (which is on the northwestern fringe of the Toronto market) and West Coast flagship in Victoria (which is on the southwestern fringe of the Vancouver market). The secondary French-language networks TVA and V are not carried terrestrially in Western Canada, although they are available on cable. CIII-DT-41 had always been considered the flagship station of Global in Toronto despite being a technical satellite station of CIII-DT, which is licensed to Paris, Ontario. However, since July 2009, the CRTC has considered CIII-DT-41 "the originating station" of Global Ontario. Canada is unique in that they have government owned stations that operate independently with shared programming from the CBC and SRC as well as locally produced programming. This is similar to PBS in the USA. Note: All flagship stations are located in Sydney and Melbourne. The show View from the Bay is produced at KGO-TV in San Francisco and syndicated to ABC owned-and-operated stations and Live Well Network nationwide. Family Feud has WUPA as its flagship station, as the show is produced at the Atlanta Civic Center. 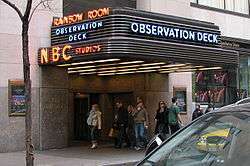 In the United States, the term "flagship station" may also be used in the broadcasting industry to refer to a station which is co-located with the headquarters of its station group and considered the company's most important station (such a station may or may not be affiliated with one of the major networks). For example, WDIV-TV in Detroit, affiliated with NBC, is the flagship station of Post-Newsweek Stations; and WGN-TV in Chicago is the flagship station of Tribune Broadcasting. ↑ "Jorge Delgado Named President and General Manager of Univision Flagship Station KMEX and Telefutura Station KFTR". Univision. February 13, 2002. Retrieved 2007-10-31.